Through the years, Allen’s biology students have been instrumental in collecting data and observations about the iconic fish that’s been dubbed “the King of the Kelp Forest” in scientific reports. Gone for decades from SoCal, the bass is now being found in good numbers in the shallow waters off La Jolla, San Clemente as well as Santa Catalina and Anacapa Islands. 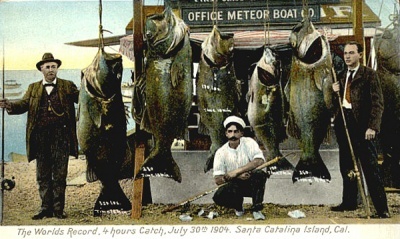 Once called the black sea bass, the giant sea bass is another in a long line of aquatic critters that were overfished at the turn of the century and into the ’30s. Since the fish hung out in large aggregate groupings in shallow waters, they were easy to catch. The big fish were targets of gill netting and later spearfishing in the ‘50s which pretty much wiped them out. With the coastal gill net ban in 1994, however, the few remaining bass ever so slowly started to increase their numbers. TAKING TOO MANY – Giant sea bass were easy to catch since they swam in shallow waters and in big groups. Part of the long wait for the return of the bass is that the fish grows very slowly and they don’t mature until they are 11-14 years old. Bass mate in pairs with males and females circling one another up in the water column just after dark with the female releasing millions of planktonic eggs while the male fertilizes them. One large female was estimated to have 20 million eggs in her 50 pounds ovaries. Allen and his students have been studying the fish since 2010, first gathering data from fish heads retrieved from fishermen. “We do a lot of work on a shoe string,” he says. Those head and tissue samples yielded plenty of information about age, food, etc. Those heads (today, Allen has about 70) also tells a somber fact: much of the genetic diversity of the bass is lost forever because of its near extinction. Today there are additional challenges for the gentle giants, especially from sport fisherman who accidently catch them and don’t understand the correct procedures for proper release of such a huge fish. Released fish often just “float away dead” says Allen. Right now, giant sea bass that swim off the coast are still young – about 20-25 years old. Give them another 20 years, says Allen, and we could see even more giants among us. 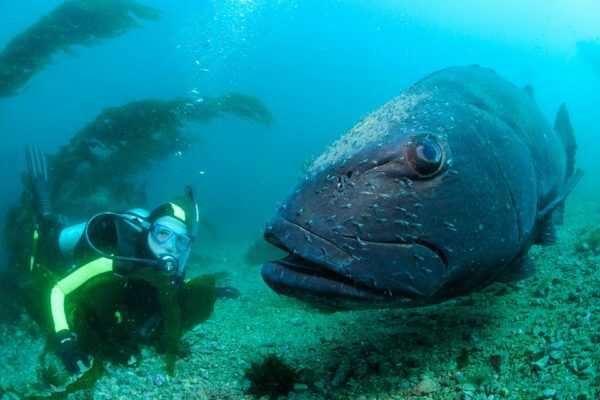 Want to see a giant sea bass but not into diving? Three of them make the Aquarium of the Pacific their home.